Larmor : action of magnetism on light, 112. Lens : formation of image by, 26. Leverrier: discovery of Uranus, 24. Linear measurements : attainable accuracy in, 25. Lorentz: action of magnetism on light, 112; aberration, 156. Magnetism : action on light, 107. Magnification : produced by lens, 27 ; loss of light in, 27; of fringes by interferometer, 32. Mercury : analysis of radiations of, 80. Meter : manufacture of, 87; value in waves of cadmium light, 104. Microscope : efficiency of, 25; limit of resolution of, 30. Molecules: complexity of, shown by spectrum, 82. Morley : measurement of coefficient of expansion, 55. Moving media: effect on velocity of light, 151. Newton: corpuscular theory, 45; spectrum, 60. Objective: relation to size of diffraction pattern, 30. Pendulum : motion of, 6; as standard of length, 86. Phase : defined, 7; loss of by reflection, 16. Quincke: interference of sound, 9. Rayleigh : diffraction of sound, 21; discovery of Argon, 24. Reflection : change of phase on, 16. Refraction : comparison of theories of, 47; index of, 50; measurement of index of, 51. Resolution: of telescope, 29,130; of microscope, 30; of spectroscope, 62; of grating, 121; of echelon, 125. Ripples: interference of on surface of mercury, 11. Rogers: measurement of coefficient of expansion, 55. Screw : testing with interferometer, 57. Simple harmonic motion, 6; curve, 7. Slit: diffraction produced by, 22. Soap film : colors of, 14. Sodium : spectrum of, 61: distance between lines a standard of measurement, 62; distance between lines of, 66; analysis of radiations of, 78; action of magnetism on radiations of, 107. Sound waves : interference of, 9; diffraction of, 19; shadow produced by, 20. Source of light : distribution of, 75. 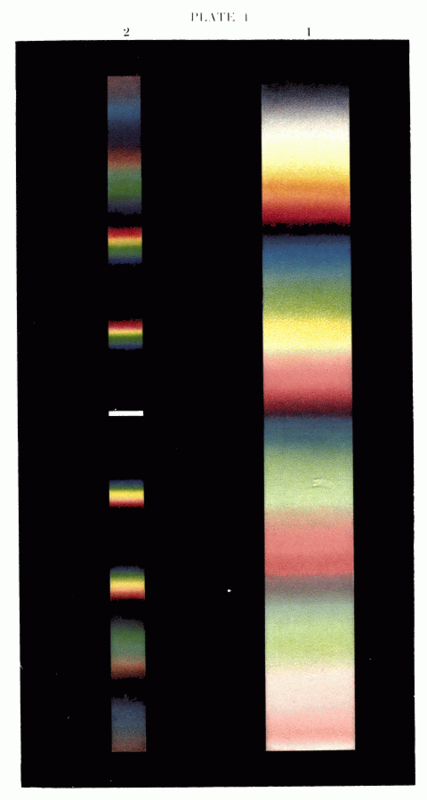 Spectral lines: structure of, 62; analysis of with interferometer, 73. Spectrum, 60; of sodium, 61, 78; of hydrogen, 78; of thallium, 79; of mercury, 80; of cadmium, 81; order of, 121. Star discs : size of, 143. Telescope: efficiency of, 25; limit of resolution of, 29,130. Thallium : analysis of radiations of, 79. Tuning-forks : beats formed by, 12. Vacuum tubes : as sources of light, 75. Velocity: of wave motion, 8, 146; of light, 146. Visibility : defined, 68; curves with the interferometer, 70; with the double slit, 139. 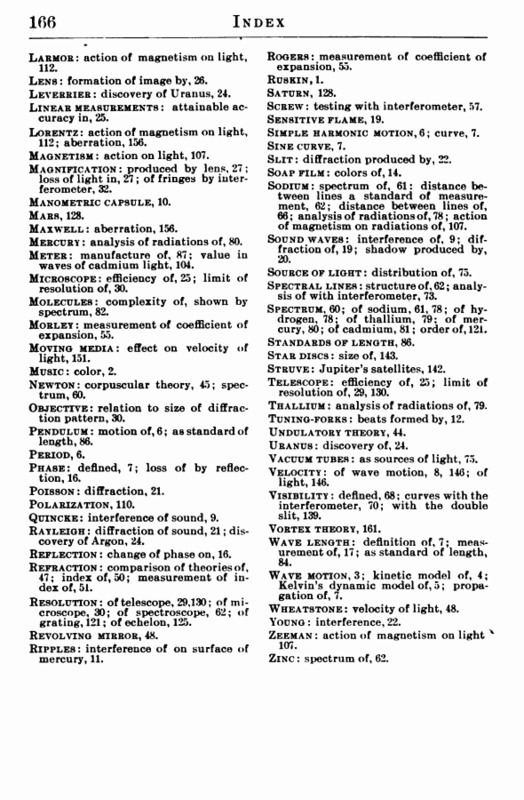 Wavelength: definition of, 7; measurement of, 17; as standard of length, 84. Wave motion, 3; kinetic model of, 4; Kelvin’s dynamic model of, 5; propagation of, 7. Wheatstone: velocity of light, 48. Zeeman : action of magnetism on light x 107. Zinc : spectrum of, 62.